You know, there were many times during this process when I thought it would have been much easier just to have someones else make our car club plaques for us. But that was just the frustration eating at me --like when I couldn't get aluminum to melt. Looking back, I still think I wouldn't have done it any other way. Over a hundred hours spent learning, trying, failing, and finally succeeding. Well worth my time. As they say, "...try, try again." Here are a few fails, and my first success (left). In the beginning, the "club" was really only Ed Gallagher and I. Two guys crazy for vintage Model A roadsters. We were both building our first A-V8s at the time but didn't know each other until a mutual friend introduced us to one another at a Bob's Big Boy cruise night. It would actually be another year until both of us could drive our cars together. I, having the head start, finished my car first. But Ed worked really fast and had his running within a year. Then we hit the roads! After that, it wasn't long until we started on a mutual project. We bought a old hot rod '28 roadster pick-up from Carpenteria, CA. We fixed it up and our friend Cesario Tio bought it. Soon, we were thinking maybe it was time for us to organize a car club. We threw around a few names, nothing worked at first. But Ed thought "A-V8ers" was the best of our original name creations, and it stuck! Personally I liked it for multiple reasons; A-V8ers sounded like 'Aviators', and I love WWII airplanes. Plus only hot rodders know what an A-V8 is, so it's pretty specific to the rodding genre. Now that we had a name, naturally we needed a plaque. I started scribbling... and I don't know what I was thinking at the time? A fighter plane? Ed said "No...! ", he was right. Then I traced a roadster, but couldn't get it small enough and with enough detail to include in the plaque --so it was words only. The idea of making the plaques at home came from a member of the HAMB. Member 'Pins&Needles' did a tech post on how to sand cast at home. His information inspired me and I ran with it. Above are some of the tool & materials used to make the pattern. After sketching & sizing a design possible to carve, carbon paper was used next to transfer the design onto 1/4" solid Basswood planks. An X-acto knife was the best tool. I was able to shave tight compound curves with it, especially inside the 'ers' script. I was lucky to find those tiny letters on eBay. They are vintage announcement board push-in-velvet type letters --you know, like from church or a cafeteria. But these are very early originals with a patent date from 1891, and some are made of brass & resin. If you think you can draw it better, do it, and I'll replace mine with yours! Once the larger wood letter designs were shaped, I assembled the master using ordinary wood glue. But not before I used leather as a background. That is because I noticed that many vintage plaques had a textured background, most looked like leather. So not finding a suitable substitute, I used the real thing. Here it is! A little powdery from the mold release agent, but it's ready to make multiple copies. Multiple copies... psst! I made it sound too easy, well it isn't! First, casting sand is fickle and unforgiving. Then there are rules to be followed when creating a master pattern --break one, and hours of frustration may ensue. Luckily, on my first try, I did pretty well. Really it's only the hole in the A and the one the top of the 8 give me trouble. But it's also the inside edges of the raised frame that get messy, I may not have put enough of a slope on them, so the sand tends to crumble. You see, all the parts of the pattern have to have at least a 1º slope. So when the cope or drag is lifted the sand can just pull away and not rub the side of the pattern, becoming damaged. This is the sand I've been using, it's available online and it's very good --but also a bit pricey. The benefits are that it is ready made for casting and it is quite fine --great for small details. Unfortunately, a portion of sand is lost after each pour of metal. The binder in the sand burns and turns the sand to a dry black powder which I separate and throw away. I plan on making my own casting sand soon enough. Pro-Craft is also the maker of the mold parting powder. Although I have since learned that talcum powder may also be used. I used flat bar stock to make the cope & drag. The sided slope slightly to keep the packed sand in as you lift it off the pattern. I'm using a found makeup brush to apply the parting powder before the sand goes on. By sifting the sand through a wire mesh I cover the pattern with smaller clumps that get into the fine detail better. That is then followed by clumpier sand right out of the can. Next, I'll pack the sand down with medium force into all the details of the pattern. By eliminating air pockets the sand compacts holding it's shape very well. I continue until the compacted sand it higher then the top edges of the drag. Then scrape the mound flat with a metal edge, like with this metal ruler. Doing this lets the drag sit on the table top level. A small prayer and I'll carefully lift the drag off the pattern hoping that I'll finally get a perfect negative --it hasn't happened yet. Maybe you noticed, the plaque master is adhered to a pane of glass. I'm having a bit of trouble getting it off. OK, now that drag is good to go, it is time for the cope. The process is the same, but this time no pattern because the back of the plaque is flat. I don't bother to sift the sand either, just clumps strait out the can. After compacting it, so it holds it's shape, I use a 3/4" tube to poke a hole to filling the mold. This is called a riser. Three smaller 1/4" risers vent the mold of air as it fills. I'll place the cope over the drag, making sure I can see a cavity through each riser. The filling riser should be below the level of the smaller risers. It's time to pour the mold!!! My favorite part --it's crazy-dangerous and fun! 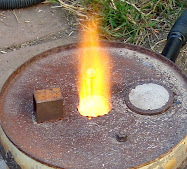 I have written another blog page dedicated to how to build & use a "flower pot furnace" to melt aluminum at 1500º. Holy-cow... liquefying aluminum was more challenging then I ever imagined when I started this project. It certainly isn't something for the timid. Now that I have poured the metal, it needs a while to cool & solidify. Freshly uncovered the binder/oil in the sand smokes from the high heat and releases a noxious smell. But another success! And another sigh of relief. And the work continues... after the plaque cools, it's cleaned with soapy water. Then the risers are cut off and ground smooth to the backside. Using hand files good for removing a soft metal, I'll shape the sides & face flat. Removing any of the textured sand finish left by the sand mold. Then using progressively finer sand papers, I continue to smooth the top edges of the plaque to be polished later. A small blocks of wood and sandpaper are used to smooth the Hollywood that is below the top level and inaccessible with a file. Eventually I'll get to using the finest sandpapers which are wet/dry, 800, 1500, etc. I'll use blocks of wood or my hands alone to sand with water washing away fine particles released from sanding. Finally, a paste polish is used to get the metal to a brilliant mirror like finish. Many hours are spent filing & polishing, but the final result is well worth it... Ahh. Painting in the relief is the easy part --mask around the edges, and some of the letters. Then spray paint it and wait until it dries to the touch. Then remove the over-spray with some lacquer thinner on a rag over a finger. In conclusion, while it may have taken perhaps one hundred hours of work from the idea, to the first plaque to be finished. I have satisfaction in that the A-V8ers now have a tangible items that will perhaps live on in hot rod history.